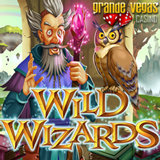 December 18, 2014 – RTG launched a spellbinding new slot game this week called Wild Wizards and Grande Vegas Casino is offering some nice bonuses to take it for a spin. The new slot from Realtime Gaming has five magical bonus features. Wild Wizard symbols and Spell Book scatters trigger free game features with Held Expanding Wilds, Mad Magic Multipliers, Bonus Symbols and Extra Wilds. Until the end of December, Grande Vegas Casino is waving its wand and doubling your deposits (up to $100). They'll even throw in 50 free spins on Wild Wizards. Coupon code WIZARDS50SPINS. Wild Wizards is a 25 payline video slot where one of five mystical bonus features is triggered whenever a Book of Spells symbol appears on the first reel and a Wizard on the last reel. The Sorcery Feature gives 10 free spins with extra Wizard symbols. The Wizard’s Tower Feature gives 8 free spins with the Wizard wild symbol held on the middle reel. In the Mad Magic Feature, players get five free spins where 4, 3 and 2 of a kind prizes pay x5, x50 and x500. During the Polymorph Feature, the triggering Wizard will cast a Spell to reveal Bonus Symbols and award free games where Wilds replace Bonus symbols.